Uglyworld #4 - Wage's Love For Irn-Bru, originally uploaded by www.bazpics.com. Wage may only be a little guy (don't say it too loud in front of him unless you're prepared to deal with a massive strop followed by mood-swings galore for the next few days), but he sure has a big thirst. When we were over in Scotland during May we picked up a few crates of Irn-Bru to bring back to Germany with us, as for some reason any of the neighbouring countries don't import it (crazy we know, but that's a rant for another day). Anyway, this afternoon we settled down on the couch to watch the Formula 1 qualifying live from Silverstone and Wage reminded us of the Irn-Bru that was sitting nicely chilled in the fridge, so off he Ox and Ice-Bat went up the stairs to the kitchen and returned with 3 cans, 1 for each of them. I asked Wage where the fourth can was for me and he just did his usual little snigger-like laugh while slurping on some of his cans contents. 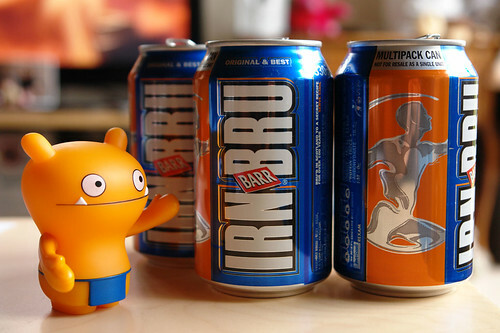 I warned him not to over do the Irn-Bru as we were on our last crate of 24 cans already, he seemed to get the message, but knowing how much he loves the stuff (almost as much as myself and Mireille) there probably won't be much left in the fridge in a few days time. Babo and Jeero are massive fans of Sebastian Vettel, and with him taking pole position for tomorrow's race they were off to the local bar as soon as qualifying finished, as they always do when he does well in qualifying or racing - they're quite the beer-drinkers that pair. After the Formula 1 qualifying was finished he proceeded to remind us of the first time he tasted the famous Scottish soft drink, and remarked on how it was destined to be his favourite drink due to the colours matching himself perfectly.